ISLAND COLONY HOTEL . This hotel was decorated in tapa from Tahiti and Fiji. The authentic tapa hangings created a focal point of interest in a simple and undetailed architectural space. The furniture was imported from Hong Kong and Indonesia. 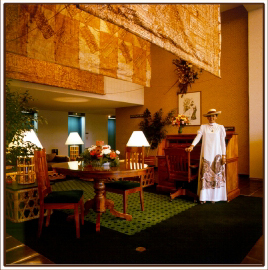 The Hawaiian activities desk in the lobby was in koa and was manned by a concierge in traditional Hawaiian dress. Adams Design over saw the design and fabrication of the room furniture as well, which was executed in rattan and teak. PLAZA HOTEL. This property is located under the freeway access to the Honolulu International Airport. 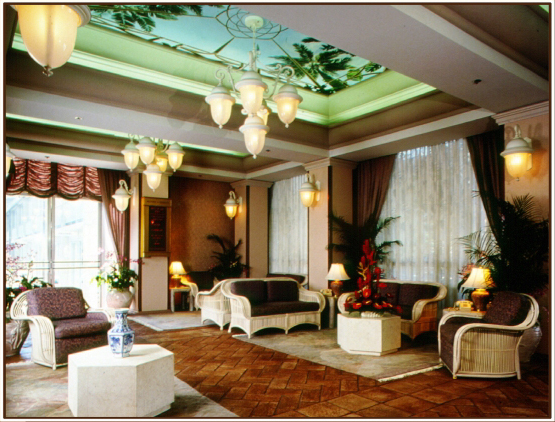 Because of its negative view situation we designed the lobby to be an oasis into itself. The windows are draped in a sheer fabric with a palm leaf shadow impression which effectively blocks the view while allowing a pleasant indirect glow of daylight. The lack of view is dealt with by the transformation of the ceiling into panels of Trompe Loeil commissioned by a local artist to create a view as if at the Honolulu Zoo looking up. This overhead includes plants, tree tops, birds and monkeys. This light hearted solution to a difficult location brings a smile to the guests waiting in the lobby lounge.